And, of course, he is making it clear he believes the position will offer him total immunity from any kind of prosecution over his 3 decades of kleptocracy in Sarawak. The powers that be, including Malaysia’s PM, ought not to pander to these vanities, because if they promote Taib in this unnecessary and indeed unlawful way the world will hold them complicit in his corruption, which is known to all. Outraged opposition YBs took their case direct to Najib’s office yesterday and also to the Malaysian Anti Corruption Commission (MACC). Sheepish MACC officials confirmed in that meeting with PKR’s Rafizi Ramli and YB See Chee How that their long-standing investigation into the despotic multi-billionaire continues. However, publicly they have also announced that since Taib’s juniors and not himself signed off his family’s outrageous land grabs, amongst a host of other abuses, they still require proof of culpability (could a generous donor please be found to hire the MACC some decent legal advice?). Meanwhile, other public figures have placed the issue before the courts. How could the CM, who has broken the constitution through his company directorships, asked DAP, be allowed to become Governor – a position that also forbids company directorships? Today the Kuching High Court came back to say that it was not its role to ban such an appointment by the Agong. However, the ruling commented that surely Taib would give up his directorships if appointed Governor! What better confirmation both that Taib has directorships and that they are illegal? So, despite the widespread recognition that Taib has transgressed the law, there is no will to halt the progress of his cream coloured Rolls Royce from Demak Jaya to the Astana, unless the Prime Minister himself does the job he was elected to do and protects the people. The PM would do better to avoid being tarred with Taib Mahmud’s dirty brush. Indeed it was Najib, conscious Taib’s shameful record in Sarawak, who has been a key factor in pushing out this outrageous kleptocrat. 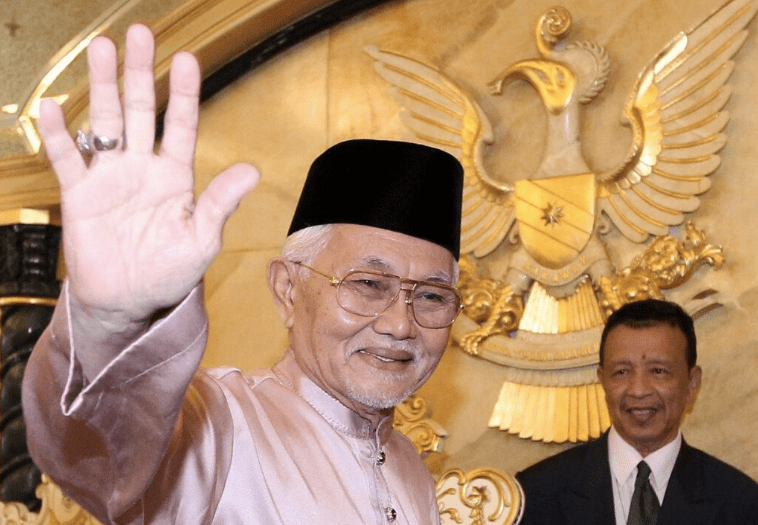 There is no doubt that Taib himself, despite his stories to the press, wants to remain Chief Minister. But, the PM should not leave the job half done and allow this experienced operator to wriggle up into a position of supposed immunity. He should chop him out of power forever. 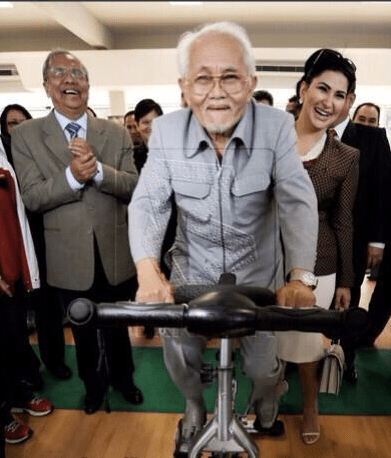 Because, if Najib allows Taib to become Governor, with his own chosen replacement (a heart patient who is also a relative) sitting in his old office, he will continue to act as though he remains in total control of the state. So much so, that the old dictator yesterday astonishingly authorised the announcement of plans to build no less than 5 news dams in Sarawak, beginning within just one year. That is quite some master-plan to announce two days before leaving office and a clear message that Taib plans to continue calling the shots, even over this highly controversial hydropower programme, which has outraged the people. It is a sign of hubris bordering on total insanity and Najib should be wary of an old man, who is ceasing to accept reality. Taib is ready to confront the protesting public head on over the dam issue, while at the same time making huge profits for himself from the construction contracts awarded to his own companies. Indeed, the retiring Chief Minister’s behaviour is becoming increasingly scandalous and embarrassing by the day. 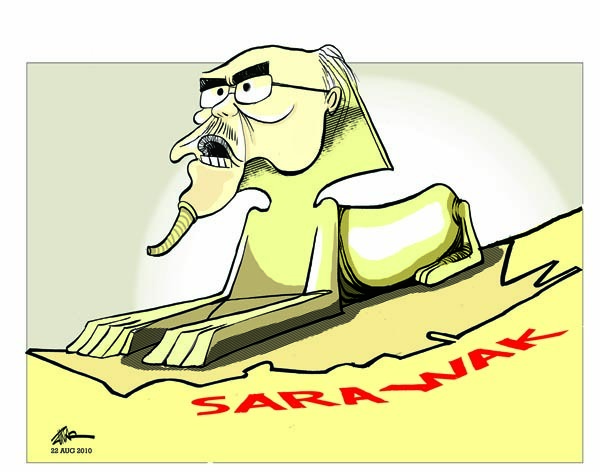 Whereas before the Prime Minister could present the Sarawak’s White Haired Raja as an awkward inheritance from past times, if he appoints him Governor he will take full responsibility for the unhappy consequences. Owl,Brian,Tiuniamah,Tigerkey,Anon,WorstNation and zealous commentators are you guys invited for the elevation to the Yang Terutama….. event? What are you guys dressing for the occasion? WorstNation would recommend black pants and black long sleeves. Okay with you guys? Better go naked to let him know that we the people aren’t happy that he promoted himself without consulting us, the people who are going to bury him when he is dead! !